When it comes to choosing a hardwood floor refinishing Alpharetta homeowners can rely on, there’s no shortage of businesses claiming to be the one. However, choosing the right Atlanta-area business can be a little more challenging. Of course, you want to ensure the result will be gorgeous hardwood floors you can be proud of, but there are other things to keep in mind as you make your selection. Hardwood is beautiful, but maintaining it is often an intimidating task for homeowners and business owners alike. What should you do when your beautiful hardwoods start to lose their luster? Cover it with carpet? Oh, please, no! Wood is much too lovely and functional to hide behind carpet. They key is knowing how to take care of those hardwood floors, or rather how to find the service that can expertly handle the task for you. If you are a homeowner or business in Alpharetta, GA, looking for hardwood floor refinishing or installation services, call Atlanta Floors. Atlanta Floors really went above and beyond to make the place look nice for a reasonable price. ​What’s your vision for your new hardwood floor? At Atlanta Floors, we can bring it to life. Imagine any species of wood, in any room of your home or office, complete with finishes that will enhance the wood and protect it against damage. In addition to solid wood (plank) floors, you can opt for engineered wood and laminate — two great options that allow you to pick the floor best suited to your home or office’s needs. Hardwood stairs are difficult to finish properly, which is why they are often carpeted. Why not let Atlanta Floors remove the carpeting and refinish the stairs or replace the stairs entirely with new hardwood stairs that match your floors? After years of wear and tear, wood balusters are often chipped or cracked, with a worn, dull finish. We can replace those with iron balusters that are durable and they’ll complement your hardwoods while giving your home an updated look. ​If your floor has suffered water damage, scratches or gouges, pet stains or discoloration, you need the professional repair service from Atlanta Floors. No need to settle for less than the best for your home or business. Does your home or office have beautiful old hardwood floors? 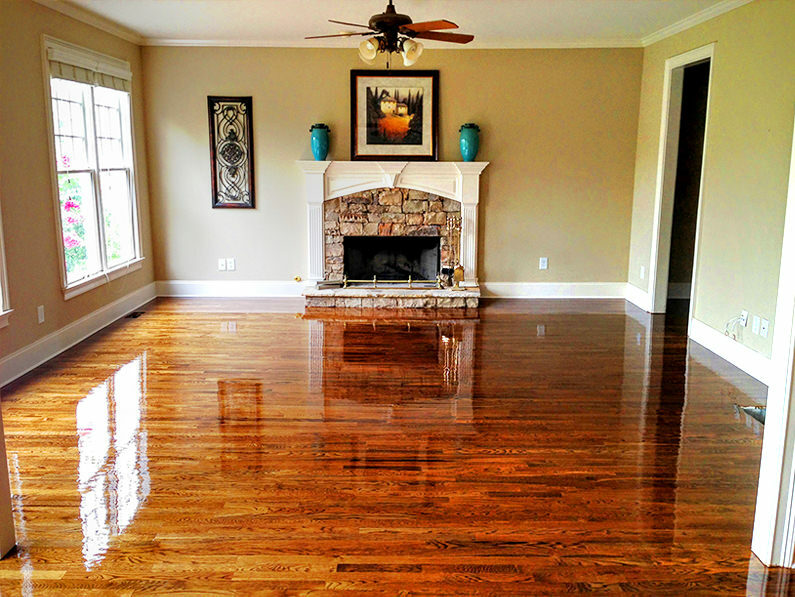 Let a qualified hardwood restoration professional at Atlanta Floors make your vintage floors look brand new. During the restoration process, your floors will be cleaned and re-coated to bring out their original beauty. Contact our team today at (404) 915-5054 to learn more about the hardwood floor refinishing Alpharetta GA can trust to do the job right.